Apple has added an additional security feature to iOS that allows users to control exactly which apps can have access to the microphone. Yes, the microphone that you speak into on the device, either at the bottom of an iPhone / iPod, or at the top of an iPad. This offers a way for you to improve your privacy and security, and to see what apps are using the microphone on your iPhone or iPad. Using this app list, you can then control and toggle what apps are able to use your microphone as well, so if you decide you no longer want to allow a particular app to access the mic, you can turn it off easily. You’ll find the complete list of apps that have requested access, and whether or not they have microphone access is determined by the ON/OFF toggle switch. Flipping any of those switches to the OFF position prevents that app from accessing the microphone, but in most cases the app itself will continue to function. It’s worthwhile to review this list from time to time for your own privacy purposes, but it’s particularly important with iPhones, iPads, and iPod touch devices that are given to children and/or deployed in environments where per-app control of microphone access is a valid security precaution. Users who wish to lock down microphone usage further can use the Restrictions and Parental Controls functions to set a preference, and then prevent any adjustments from being made by other parties, or even prevent all apps from gaining mic access, which effectively disables the microphone on the iPhone/iPad completely (with the exception of the phone app for iPhone users, of course). Some of the apps listed in the microphone access list may surprise you at first, but you should take into consideration all functions of the app before jumping to any conclusions. For some examples in the included screen shot, you may think it’s odd that Instagram, a photo sharing app, has requested access to the microphone, but that is actually due to the relatively new inclusion of video to the site, and thus the microphone access is required to grant audio to the videos posted to Instagram. For an app like Google, the microphone access is necessary to use the really useful Google Now feature, which gives you Siri-like functionality for queries and searches. Other apps like Skype are more obvious to be in the list, because without microphone access a VOIP call would be without the voice element. If you do see an app that clearly does not belong in that list however (like some games) go ahead and turn it off, since you’ll probably notice if it was truly necessary or not the next time you use that app again. Users will also find that a separate microphone access control will appear manually from directly within certain apps, when that app attempts to request usage of the mic. This is very clearly identified with a message “Appname would like to access the microphone” with two choices: “Don’t Allow” and OK”. Any app that has had that dialog box appear will also register in the Privacy > Microphone settings, unless the mic has been turned off as a privacy or security precaution. 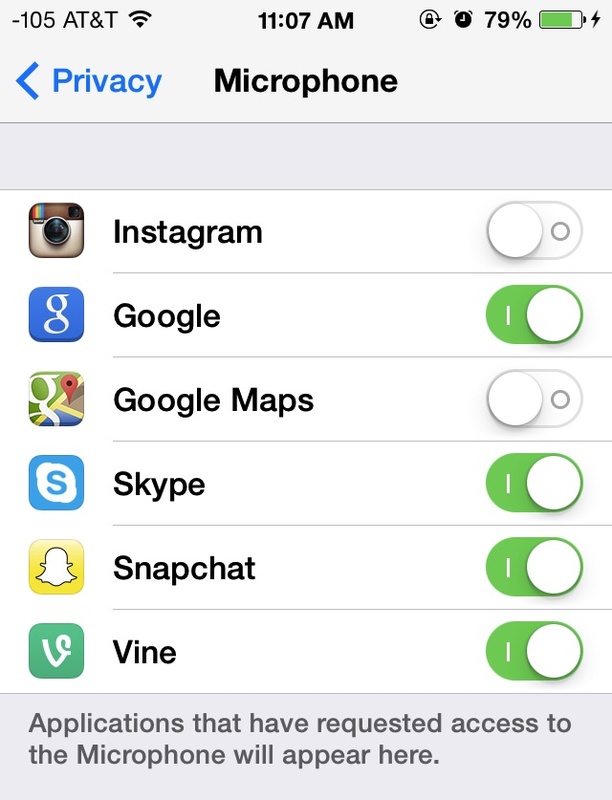 Users can also control what apps can access their photos in a similar manner. Hi! I need help I’m desperate. So when I go to see what apps need acsess to my micerphone nothing shows up! Please help what do I do!!! It only shows you the apps that have “requested” access. What about the apps that are simply accessing it?